Extremely interesting story out of Florida. Concealed Carry Permit holder takes action. Does a story like this serve to support the practical application and collective good that the second amendment delivers to law abiding citizens? Part 3 of my day at the range with Sgt. Davis, I put my very first rounds down range through my new Sig Sauer STX 1911. I had a few failures but I attribute this to a "break-in" period for my new pistol. I experienced similar failures when I put my first few rounds through my Kimber Pro Carry II, however, it has since performed flawlessly after I fired through a few magazines. Enjoy the 3rd and final part of this fun video series! At the Range with my Best Buddy Ryan (and our firearms). One of the most enjoyable aspects of the sport of shooting, for me at least, is the joy of sharing my firearms with my friends and visa versa, this is especially true when it comes to my inner circle of friends. My army buddy Ryan is one of these close friends who I very much enjoy going shooting with. Ryan was my first roommate in the army, he has since moved onto greener pastures but we keep in touch and go out to the range together whenever the opportunity presents itself. As it so happens, Ryan's girlfriend River was in town visiting from the great state of Tennessee and what better way to welcome her to Washington than with a day of shooting? We brought out a nice variety of firearms including Ryan's 1943 Mosin Nagant 91/30, my 1946 Mosin Nagant M44 and Polish AK47 underfold (always a fan favorite). For handguns, Ryan brought out his classic 1060's era Smith and Wesson 38 Special and my Kimber Pro Carry II in .40 caliber as well as my Springfield 1911-A1 in .45 ACP. I'm happy to report that after this range session, I'm finally feeling more confident in my Kimber Pro Carry II in .40 as a concealed carry firearm. The Kimber magazines were crap, so I ordered two Mec-Gar magazines and they worked almost flawlessly. See you when I come visit y'all in Tennessee, River! It's looking like there'll be a total of 3 parts to this video from my day at the range with my good buddy SGT. Davis. In part 2 we have a closest to the bulls eye competition featuring me and my Czech VZ24 Mauser vs his Mosin Nagant M44. Loser buys the beer! I recently enjoyed another fun, fabulous day at the range, this time with my army battle buddy Sgt. Davis, who is also the person who introduced me to my new favorite local shooting range, so I was glad to have the opportunity to go out and enjoy a fun day with him! There will be multiple parts to the video, not sure how many because we ended up with a TON of footage, so far I've only managed to edit Part 1 as seen below, but rest assured, I'll get through the rest of it and upload the remaining parts later this week. In Part 1, Sgt. Davis zeroes in a new red/green dot sight for his WASR AK47 as well as demonstrating a tactical reload with the AK. 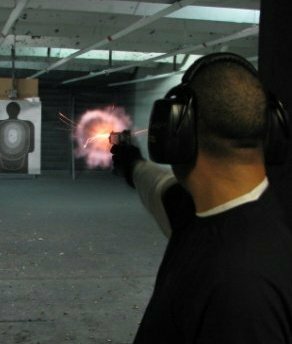 For my part, I practice the tactical reload a couple times, then let loose by firing two full magazines through my Polish AK47 underfold while employing the tactical reload to when the first magazine goes empty. Enjoy Part 1 and stay tuned for more! Enjoy this short video of my day at the range with my new Kimber Pro Carry II .40. It's called the weekly girls with guns photo gallery but it's not really weekly. I don't think anyone cares that it's not actually posted weekly. I had noticed this nice looking Kimber in the display case on my last several trips to my favorite local gun shop Surplus Ammo and Arms, in Lakewood, WA. I wasn't really looking to buy another handgun at this time but decided to have a closer look at it and asked the salesman if he could pull it out of the case. 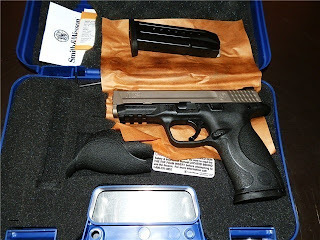 At first glance it looks like a .45 CDP but much to my surprise, it wasn't a CDP but a Pro Carry II in the same bi-tone color scheme as a CDP and it wasn't a .45 it was a .40 S&W! I had never seen a Kimber like this before. I simply couldn't resist the temptation to pick up this beauty, so I put it on layaway. I was able to bring it home yesterday, but in the interim I had done some searching on the internet was unable to find this same configuration available for sale anywhere on the internet! A rare find indeed. I'll be taking it out to the range this Thursday, so stay tuned for a new video later this week! The Collection Continues to Grow - Smith and Wessom M&P 9mm Nickel Boron Slide, Kimber Pro Carry II in .40! I spotted an extremely unique pistol yesterday while I was buying ammo for a day at the range with my sister (video added yesterday), it was a good looking Kimber and at first glance is looked like a regular CDP. I just peered at it through the display case, admiring it's beauty but I didn't bother to have the sales man take it out of the case as I'm simply not in the market for another .45 right now. I haven't even fired my new Sig Sauer STX 1911 yet! I went back to the gun shop today, my favorite, Surplus Ammo and Arms to pick up a VZ24 I had put on layaway last month (photos and details coming soon on that beauty) and while I was there I decided to go ahead and have a closer look at the Kimber. Much to my amazement, not only was it not a CDP, it wasn't even a .45. This unique Kimber was a Pro Carry II, chambered in .40 cal and bi-tone like a CDP. I had never seen this before. The price was right at $699 (used), I couldn't resist and went ahead and put 33% down and put that gorgeous piece on layaway. I searched and searched and was not able to find a photo of a Kimber Pro Carry II in .40 that featured the color combination of the one I bought today. 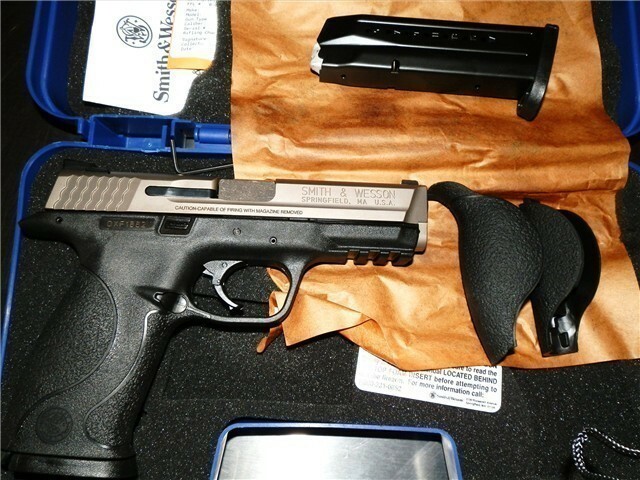 The photo below is of a CDP, but the Kimber from today looks identical. Can't wait to pay it off within 60 days, get it home and show off some photos for you. 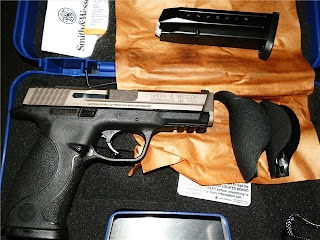 If you're a long time reader of my blog (if not go back and read some of the older posts) you'll know that my very first handgun was a Smith and Wesson M&P 9mm, which I sold when times were lean (I actually sold it so that I'd have enough money to take a particular woman on a date), however I swore I'd buy another when finances allowed. I kept that promise and purchased a new one upon my return from the middle east. I had searched high and low for one of the Cabela's exclusive range carry kit in the flat dark earth and black color scheme but was unable to locate any for sale. But what I did find the other day was an equally attractive M&P in 9mm with the Nickel Boron slide! Again, I couldn't resist and put this new pistol on layaway as well! So, now I've got two Smith and Wesson M&Ps, and that's just fine by me.